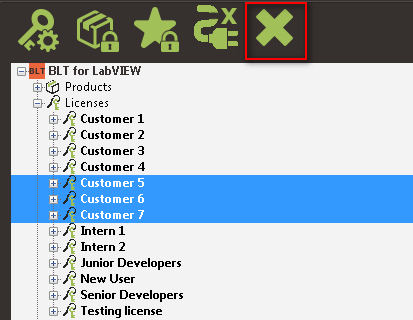 oSelect the Licenses category in the tree and click the Add License(s) button. 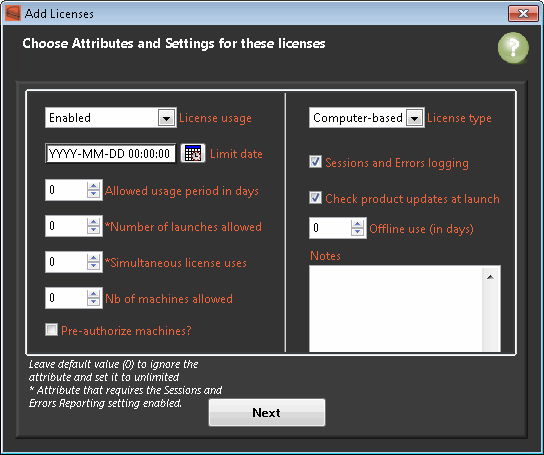 (You can also right-click on the Licenses category in the tree and select Add License(s)...). 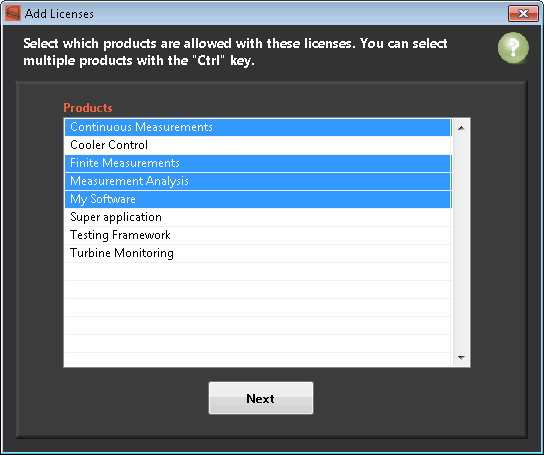 oSelect in the list to which product(s) the new licenses will have usage permissions. oClick Next to go to the next step. oNames: Must be the full names of the user or user group. Enter one full name per row. Each row will have a license created. oMatching email addresses: Must be the email addresses of each user or user group. 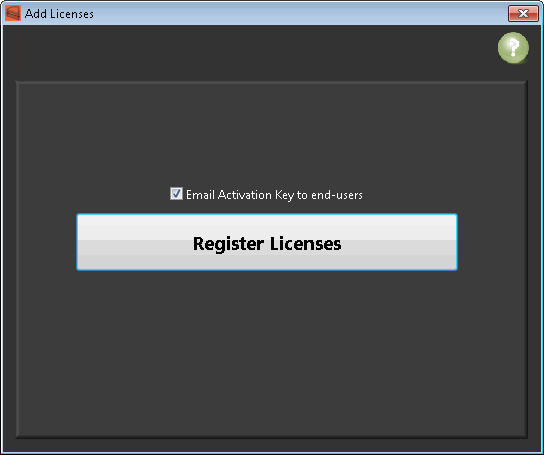 You cannot assign more than 1 email address per license. 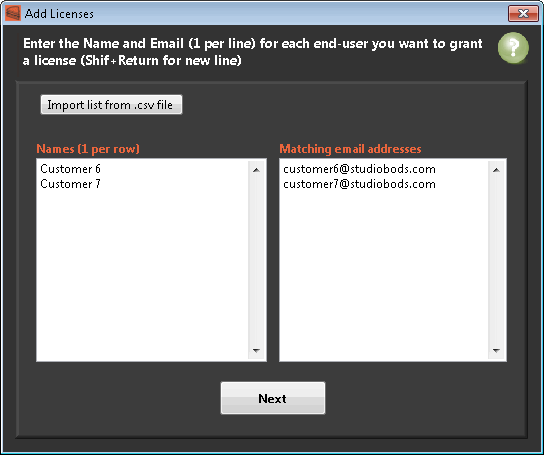 oClick on Import list from .csv file to import names and email addresses from a file. - The file must be a text file (txt or csv). - Names must be in the first column of your file. - Email addresses must be in the second column of your file. - Make sure that you don't have empty cells. oAll rows must have a valid entry for both Name AND Email. oClick on Next to go to the next step. oChoose the correct attributes and settings the new licenses. 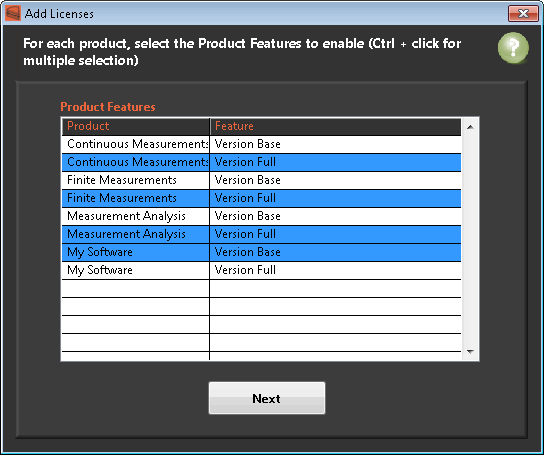 See here for a description of License attributes and settings. oIf some of the products selected for grant have features, you will see an option to select the product features on which you want to give permissions to the new licenses. Select the features that you want to allow and click on Next to continue. oCheck if you want to send a confirmation containing the Activation Key to the email addresses specified for the licenses. 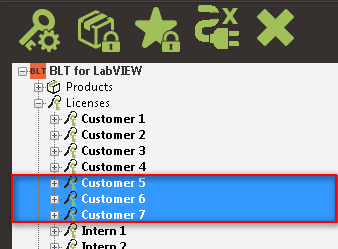 oThen click on Register Licenses to complete the process and generate the licenses into BLT. oYour licenses appears in the tree, you can now manage their Attributes, Product permissions and Feature permissions. oSelect in the tree the license(s) you want to remove. The selected license(s) will be deleted from the Licensing Server and their owners will be unable to use it to access or activate a product.